Legendary coach Jack Hazen can add one more accomplishment to his already distinguished resume: distance coach for the 2012 London Olympics. Hazen, who has coached several world championships for cross country and track and field, was hand-picked the USA Track and Field Association as a coach for the Olympics. Though the athletes each had their own personal coach, Hazen was responsible for 20 athletes in several events including 800-, 1500–, 8000–, 10000– meter races, the marathon, steeple chase, and the 20- and 50- kilometer racewalks. Hazen’s noteworthy experience doesn’t end there. He also can boast the remarkable feat of being on the USA team with the most top-ten finishes compared to any other Olympic event in track and field. Hazen, who described his role as a coordinator and facilitator for the athletes, said that just being with the world’s best runners, like Galen Rupp and Bernard Lagat, was a thrill. Coaching elite athletes was no different than those here at Malone according to Hazen. He described his coaching style as “laid-back” and “supportive” as opposed to an aggressive approach. Hazen said throughout the years he learned that positivity and support encourages athletes to believe in themselves and have confidence. Long distant runner and 2004 Olympic silver medalist, Meb Keflezighi, experienced Hazen’s support first at this year’s Olympics. “He’s available, first and foremost. He’s there to support.” Keflezighi said. He also described Hazen as aware, knowledgeable and having an overall open dialogue with others. Keflezighi said even though he was a late addition to the Olympics this year, Hazen was still flexible and responsive to the many last-minute changes. One would think being surrounded by elite world athletes would induce a star-stuck attitude. This is not the case with Hazen, however. He treated them no different than his amateur athletes. “They’re world class athletes but they’re still human beings. It’s in our minds that we build them up and make them celebrities,” he said. While staying at the Village, Hazen shared that he ate lunch with Basketball superstar Tony Parker several times as well as posed for a picture with Ryan Seacrest who asked to speak with him during one of the races. “[Staying in the Village] was pretty awesome at first, but then you just kind of go ‘oh there’s Michael Phelps.’” Hazen said. 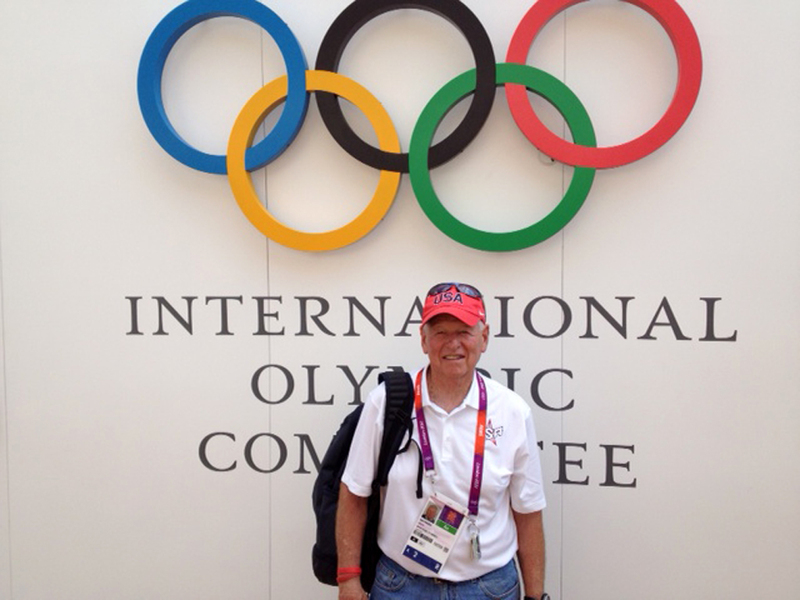 Ray Jeske, radio talkshow host for ESPN 990 and close friend of Hazen, also attended the Olympics and witness firsthand Hazen’s interactions with athletes. Jeske also said Hazen’s humility and passion for the individual makes him an exceptional coach. During his month stay, the most surreal moments according to Hazen included the training camp in Birmingham, meeting the athletes as well as witnessing training partners Mo Farah and Galen Rupp win gold and silver in the 10K. Despite the amazing opportunity offered to Hazen, his experience at the Olympics did present its own challenges. He admits that the schedule was “brutal” causing lack of sleep and high pressure and stress. Hazen was responsible for getting athletes from the village to the warm-up track and then to the call room and shared that he didn’t breathe a sigh of relief until they were in the call room. Upon his homecoming, the reception has been greatly appreciated by Hazen who shared that he is excited to get back to working with his own athletes.